Whether you’re a beginning blogger, a budding entrepreneur, or an established business, establishing an online presence usually starts with getting a domain name that supports your professional or personal website. You can purchase a domain name either by creating and registering an original name, or by buying and registering an existing domain name that’s up for sale. Domain.com has the tools you need to continue building your business into a success. A domain name is the first step toward securing a piece of online “real estate” that becomes the home of a website for business or personal use—a name that stands in for a website’s actual Internet Protocol, or IP address, which is simply a unique series of numbers. Millions of domain names are in use worldwide and more are constantly being generated and made unique through a growing list of extensions that include not only the famous .com and .net, but also more niche specific ones such as .church or .photo. A domain name points to the website it serves, so that the site can be found in searches. The cost of buying a domain name varies widely, depending on the kind of transaction involved. Web hosting providers may include a free domain name with a hosting service contract, or charge less than a dollar on a promotional hosting offer, while standard hosting rates and domain name registrars may run significantly higher. Depending on factors such as its search engine rankings or traffic statistics, an existing domain name can sell for hundreds or even thousands of dollars through a private sale or at an auction or domain marketplace. Besides the cost of the domain name itself, other costs can include fees for hosting, or for setting up or transferring a domain name from one host to another. For many users, creating a domain name is the first step in the journey toward building a consistent, reliable online identity—and that step generally involves brainstorming a catchy, original domain name or generating one with one of the many online domain name generators. With a name in mind, users can use name search tools or even a simple Google search to see if the name is available or if other names in use are close enough to cause confusion. “Buying” a domain name doesn’t necessarily mean making a one-time purchase and owning the name forever. A typical domain name purchase involving an original name actually means that buyers pay for the right to reserve the name exclusively for their own use. To buy rights to a domain name, a user has to register it either directly with a domain registrar or through a hosting provider for terms ranging from a year to several years. To keep rights to the name, a user must renew the registration when it expires or risk losing the name entirely. Creating an original domain name establishes a new and unique online identity for an individual or business, but it can take time and effort to yield traffic and visibility, especially if the new domain name is poorly optimized for relevant keywords. To reduce confusion, new domain name buyers are often advised to buy as many similar names as possible—even those with obvious misspellings that reflect mistakes people make when typing in a search bar. In some cases, buying an existing domain name can be a better option than creating a new one. A domain name that’s been in circulation for some time can have more traction with search engines than a brand new one serving a website with no content or backlinks from other sites. 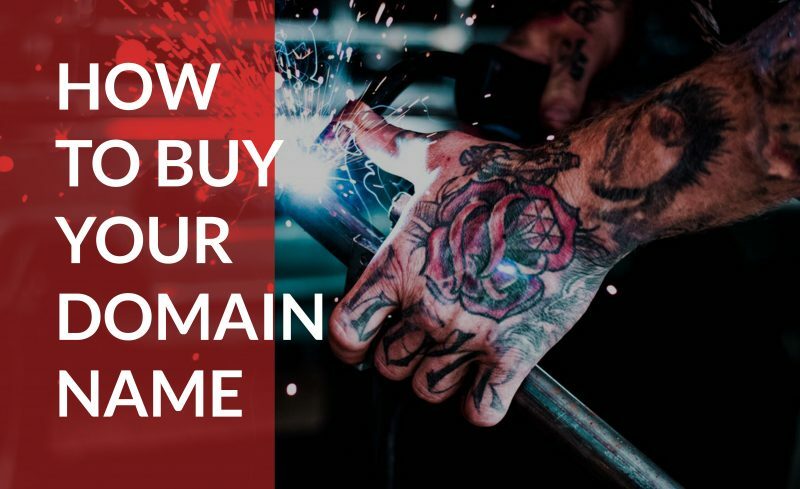 Some domains that are up for purchase may already have content such as a complete homepage or an established blog, which saves the buyer the time and expense of building a new site from the ground up. These sites may also be making money or getting traffic, which gives the new owner an immediate boost. Domain names become available for sale for a variety of reasons. Some may have been purchased as original names but never used, while others may represent websites that were developed but abandoned when a business closed, or a user stopped maintaining the site and renewing the domain name. Some become available because of a practice called cybersquatting, in which marketers buy up large numbers of available domain names to take them out of circulation and then resell them for higher prices. Buyers can purchase an existing domain name in several ways. Domain name auctions make names available for bids that can begin at less than $10 and range into the thousands for an especially desirable, keyword rich name. Domain name marketplaces also list names that are either expired or placed up for sale by owners or domain name marketers, so that users simply find a name they want and pay the purchase price. It’s also possible to approach the owner of a domain name directly and offer to buy it in a private transaction. Buying an existing domain name brings benefits, but these domains may also come with baggage. Potential buyers need to do their due diligence to make sure that they’re buying a name that’s not associated with a website that has a dubious reputation, or one that’s infected with malware or filled with backlinks to bad sites. Purchasing an existing domain name gives a buyer outright ownership of the name. But, it still has to be registered under the new owner’s name with the appropriate fees paid to a registrar or hosting company, and the new owner becomes responsible for renewing the registration at the appropriate time. Your domain name sets the tone for your online presence, and finding the right one can take time and effort. But, with options ranging from entirely free to five figures or more, anyone on just about any budget can buy a domain name to launch a business or a brand.